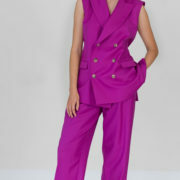 This crossed blazer sleeveless, or waistcoat, with its large tailor collar and double buttoning closing system is offered in fuchsia flannel woven in Italy. 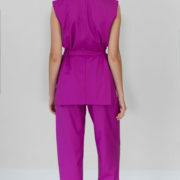 Its two welt side pockets (with a flap) and two slits at the back give your silhouette an elegant allure. The long belt allows you to adjust the volume to your preference. The blazer’s body is entirely lined in viscose.